Emory University announced today the purchase of approximately 60 acres of property at Executive Park, located near the interchange of North Druid Hills Road and I-85 in the city of Brookhaven, Ga. Emory purchased the property from Equity Commonwealth (NYSE: EQC). 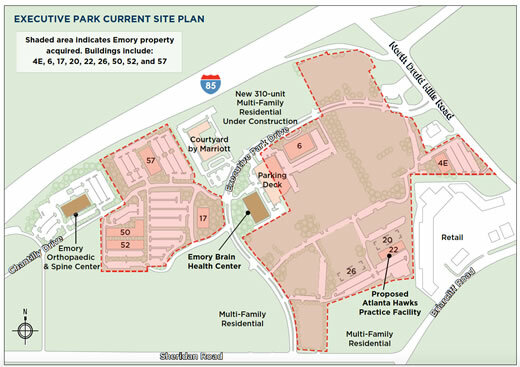 “Emory takes a long-term, mission-oriented view when evaluating its real estate holdings. This significant parcel, which is in a location accessible to all of metro Atlanta, coupled with the fact that we have successful programs in Orthopaedics, Brain Health, Medical Science Education, Continuing Education and Health Information Technology already located in the Park, presented an extraordinary, once in a generation opportunity for Emory and the region,” says Emory’s President James W. Wagner. The site is comprised of approximately 400,000 square feet of office space. Included in the purchase are nine office buildings (see site map: Buildings 4E, 6, 17, 20, 22, 26, 50, 52 and 57).